HCVKC4 steam conditioning valve combines pressure and temperature control in a single valve and is commonly used in process steam systems. HCVKC4 is an angle valve. 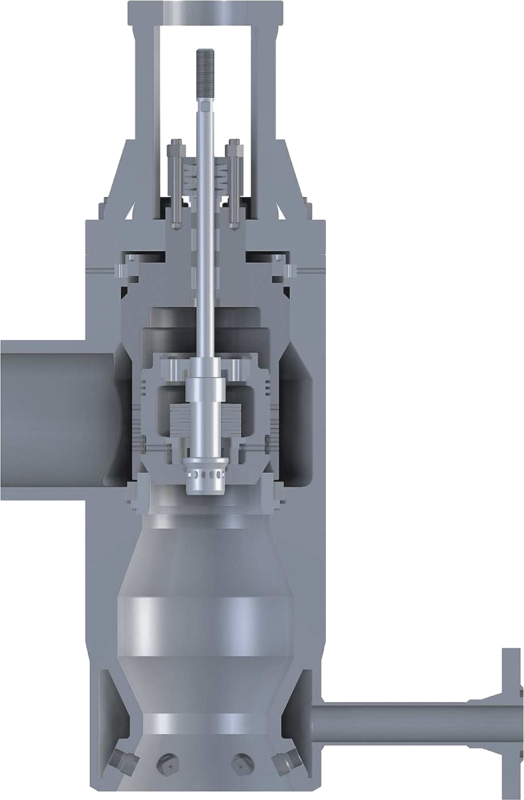 It incorporates a highly effective spraywater manifold downstream of its pressure reduction stage, at the valve’s convergent cone placed in outlet connection pipe, purposely profiled to accelerate the steam to be cooled and initialize its turbulent flow. It increases the ability of fine tuning and supports water uptake even if low velocity of the steam occurs. The valve basically consists of: the body, self-sealing inner bonnet integrated with cage, the main plug (piston-type or perforated, pressure balanced by inner plug–so called pilot plug), and the seat. Two types of seat are available: screw-in or slip-in (the latter is pressed by screw plug). At the very beginning of the valve’s stroke the pilot plug works. It controls small flows and reduces the pressure differences which affect the main plug. The reduced dynamic forces acting on main plug might permit choosing a smaller actuator. If the pilot plug fully opens, the main plug starts moving. Piston-type one opens the vents of active cage. In case of perforated plug, only its perforation is responsible for pressure reduction; the cage does not. HCVKC4 valve works with media flow directed over the plug. Any control of coolant’s flow demands an implementation of additional injection valve.